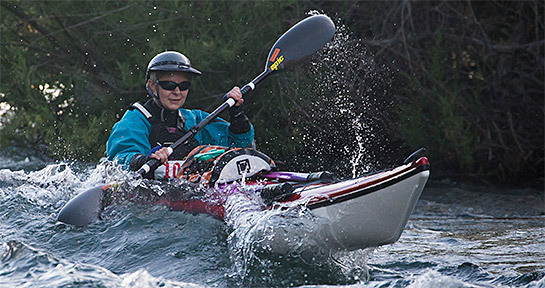 Guest contributor Krista Fechner races through a rapid in a sea kayak during the 2014 Cal 100 adventure race. Photo by Tom Gomes. Last year, the folks behind Rivers for Change organized the California 100, a 100-mile adventure race down the Sacramento River in California, from Redding to Chico. Several members of our kayaking club (BASK) did the race and had a great time, so this year, I decided to give it a shot, even though it would mean getting up before dawn for a 6 am start and possibly finishing well after dark. I had only kayaked on whitewater twice. This race would be far different, though: I’d be using a full-size sea kayak. Other competitors would be using racing canoes, outriggers, ultra-fast surf skis, stand-up paddle boards, and of course, kayaks. 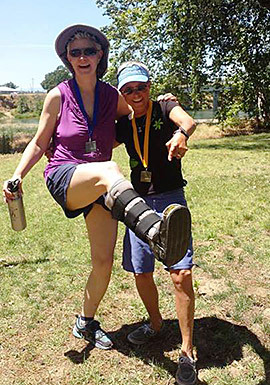 To prepare for the race, I signed up for a forward stroke clinic with racing-trainer extraordinaire Susan Starbird and started planning gear, GPS waypoints, and food. In mid-March, Nathan and I headed up to Redding to do a race prep clinic—the first six miles of the river, covered twice. At low flow levels of 4,000 CFS (cubic feet/second) due to the ongoing drought, the rapids were easy for us. Krista and Just Kayak More president/Sac River ninja, Jason Montelongo, confer on the right line to take during a training run. Photo by Tom Gomes. In mid-April, I hit a snag in my training. Upon recovering from a cold, I went out for a jog and stumbled off a high curb, spraining my right foot (or so I thought). Four days later, we had our second race prep session in Redding. Our goal was to cover the first 50 miles of the river. Flows were identical to March, so I wasn’t worried about the rapids. I was trying a new hydration system (consisting of an MSR dromedary bag on my back deck) and new clothing. The first five miles did not go well for me; I capsized twice due to the shifting weight of the water in the dromedary and had to be rescued by my companions. My clothing was insufficient for the water temperature and I became slightly hypothermic. Fortunately, I was able to re-align my water bag, keep paddling, warm back up, and complete the rest of the day without further mishaps. We only covered 40 miles because the group was slowed down by strong headwinds. For several days, I thought my foot would fully recover, but instead I found out that I’d actually fractured my 5th metatarsal. It was into an orthopedic boot for me, and no more paddling for many weeks! Krista and 1st place women’s kayak finisher Priscilla McKenney. Photo by Kristen Podolak. At this point, I had no idea whether I’d be able to do the race, but I decided to prepare anyway as if I were going to. Thankfully, I was not in a cast, so I could swim for exercise, but all I could do was pulling, no kicking. I started piling on the laps, working up to doing a mile in 30 minutes as well as swimming for an hour without stopping. I was also able to do some kayak rowing machine workouts and weight lifting at home. I glued rings into my kayak’s day hatch to better secure my water supply much lower in the boat, and drilled a hole in the back deck so I could run a water tube out of it. A couple days before the race, I had another x-ray. The doctor said the healing was on track, but that I’d have to stay in the boot for another month. He gave me permission to kayak using an orthopedic shoe. I did not ask him whether paddling 100 miles was medically advisable, because it’s pretty obvious what the answer to that question is. I made the decision to do the race anyway, rigging up a foot splint (consisting of the orthopedic shoe, an ankle brace, part of a SAM splint, and an ace bandage), and using my right foot as little as possible. I could not have done any of this without Nathan’s incredible support, which started before we even got on the road…we went out to put the kayak on the car, and my left front tire was flat! We were up against the clock to get to Redding for race registration, so Nathan whipped out this tire repair kit with a bottle of slime and a compressor that plugs into the car’s 12V receptacle. Talk about being prepared! That did the job, and totally held for the entire trip, even in the scorching Central Valley heat. He also got me to the 6 am race start on time (not as easy as it sounds), and helped me immeasurably at every checkpoint, driving to each spot, restocking my water, helping me change clothes, re-taping my hands, and applying sunscreen. The volunteers at all the checkpoints were so supportive, cheering us on, braving the 100-degree heat, and helping all racers complete their portions of the race safely. Little kids playing in the water gave me high-fives as I pulled into checkpoint 3. So cute! This was a fantastically well-organized event. Major props go to John Dye and Danielle Katz of Rivers for Change, as well as Race Director Matt Palmariello and all of the folks who hosted introductory clinics! Jason and Kasumi Montelongo shared their incredible knowledge of the Sacramento river and answered my numerous questions about the race and course. The food at the after-party…WOW! How they managed a spread that scrumptious on top of such a complex racing event is truly amazing. Turns out fellow BASKer Daphne Hougard takes most of the credit! Acknowledgements of paddlers who stopped to assist others were awesome too. Food strategy (and some hacked re-packaging) played a big part of Krista’s success and morale during the long paddle. For racing, I prefer real food and plain water to commercial energy products. Crushed-up sweet potato/carrot chips, spiced cashews, turkey jerky, banana chips, tangerine sections, and chocolate milk hit the spot. Homemade rice krispy treats made with hemp seed and brown rice syrup instead of marshmallows kept me fully fueled. My food containers worked well for eating on the river. I used plastic spice jars with flip-lids, the perforated dispenser tops hacked open with flat-edged nail clippers; these allowed me to get a good mouthful using only one hand. My hydration system, with all the kinks worked out from my practice run, was awesome. It was so nice to have water below deck rather than having to carry it on my back for that distance. I drank at least seven liters during the race. I’d heard from last year’s participants that the last 50 miles of the race could be psychologically grueling because there are so few landmarks like bridges and rapids. I solved this problem for myself by setting dozens of waypoints on my GPS for side channels to avoid, feeder streams, and bends in the river. Whenever I checked my GPS, it was never more than a mile or two to the next waypoint. I always knew exactly where I was, and this kept me really motivated and less anxious about encountering 60 miles of unfamiliar river. My kayak felt comfy for the entire race, although I’d been worried about problems with leg cramping, considering that I’d been getting very little leg-based exercise lately. My aerobic training worked well. There’s no way I could have pulled off that distance without it. A small sponge was perfect for dipping in the cold river and squeezing over my ventilated helmet or visor. A liberal slathering of fragrance-free generic zinc oxide cream prevented chafing. I only had minor chafing in my armpits where I’d neglected to reapply it. I used Leukotape (a type of runner’s tape) on my hands, ending up with NO blisters after 15 hours and 15 minutes of paddling! Smooth sailing for long distances can turn into quite a mental challenge. Photo by Lisa Thomas. Not being able to press hard with my right foot due to my fracture slowed me down and put extra strain on the right side of my upper body, but I knew this would happen and just dealt with it, pressing instead with my left foot and right knee. I took a long time at the three mandatory checkpoints where we had to get out of our boats (I stopped for a total of 79 minutes!) But it was what I needed to do on such a hot day, in my condition. There were long stretches of the race where there were no other paddlers in sight, which felt a tad uncomfortable at times. I’m used to social paddles! But I expected it to some degree, and didn’t let it bother me. Paddling after dark on an unfamiliar river was scary. Well, this was an adventure race, so it came with the territory. Luckily that part of the river was flat and easy. If there were any hazards like submerged trees, I managed to avoid them. With a higher river flow and no broken bones, I’m sure I could have finished during daylight! 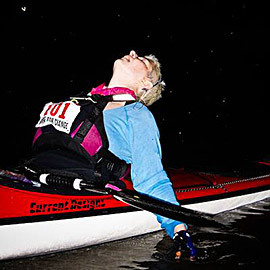 I was fortunate, only having to spend 25 minutes in the dark…many folks finishing later were paddling in the dark for hours. I had a brief bout of dizziness and nausea in the middle of the night after the race. I’m guessing it was due to dehydration exacerbated by exhaustion. I drank some water, fell back to sleep, and felt fine the next day. Despite my injury, I managed to finish second among the women solo kayakers, no mean feat for someone with only one good foot! Would I do it again? Hell, yeah! But I’d love to be in a faster boat, or maybe part of a relay team, especially if I could convince some other kayaking gals to get in on this incredible event! 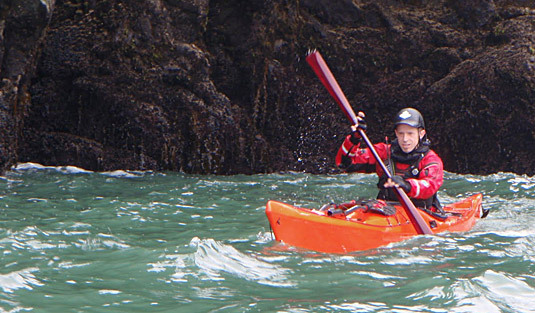 I and four other paddlers did a two-week kayak camping trip to the west coast of Vancouver Island. We were there from late June through early July. Because we traveled from Northern California with our own boats and equipment, we drove 2,280 miles round-trip in order to paddle less than 60 miles. Oh, but what an amazing sixty miles. In the video above you’ll see us launching and landing via a crane aboard a diesel freighter, encountering a mola mola after I ran over it (which I chronicled previously), hiking on Nootka Island, riding a rusty “zipline,” feeding anenomes, tidepooling, and doing a whole lot of paddling in conditions that varied from long, steep swell to placid waters, from sunshine to heavy rain, from clear skies to dense fog. All I can offer from this experience are slices of my own perspective over those two wonderful, intense weeks. To get the barest sense of being there, you can watch the short film in this post (or on Vimeo – either way, viewing it in HD at full screen is recommended), or view my photos on Flickr. While I’ve written about the boat I used and the mods I made to it in the past, be sure to keep an eye on this space (and my Twitter and Facebook accounts) for more lessons and learnings from planning and executing our own trip. In the midst of a crossing from the Cuttle Islands to the Brooks Peninsula on the west coast of Vancouver Island, in the summer of 2013, my rudder struck something. I had just glided over an ocean sunfish, or mola mola, coming to the surface to bask. I was not prepared to see a typically tropical pelagic fish that usually lives 600-2000 feet below sea level on a day paddle! The sunfish was about four or five feet in diameter, a bit smaller than an average adult male, but it probably weighed more than my fully loaded expedition boat. It was lazily flopping its top fin around after I struck it (not that it seemed to mind getting clipped by a kayak). 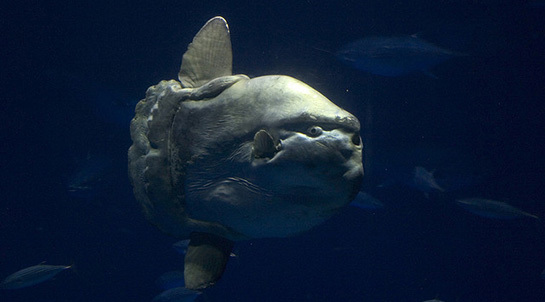 It’s thought that the sunfish’s basking behavior is to warm itself after feeding in the depths (they mainly eat jellyfish), but they’ve also been observed to float near kelp to be cleaned of parasites by wrasses. Even more intriguing, seabirds have been seen to peck parasites off sunfish, and it’s theorized that fin flapping is to attract gulls to engage in this activity. With our white hulls and shallow draft, did this mola mola think that we were birds? Did the fish even care we were there? Regardless of the reason, the sunfish let us watch it for three to five minutes before righting itself and sinking slowly out of sight. It was a magical, bizarre chance encounter with what I consider one of the strangest fish in the world. Kayaks are pretty much the only way to board the USS Thompson. or what’s left of it. Modern ruins are just plain rad. I’m a huge fan of post-apocalyptic fiction and love exploring disused spaces. Many people don’t realize that a kayak buys you admission to many such places. The San Francisco Bay Area has a rich naval history. The most visible artifacts of this history are the once-mighty shipyards at Mare Island, Vallejo, and the infamous Mothball Fleet rusting away like ghosts in Suisun Bay. A lesser known artifact is the South Bay Wreck, better known as the USS Thompson, is located in the southern part of the bay, halfway between Redwood City and Fremont, but unlike these other sites, it can really only be reached via kayak, given the shallow waters. Heck, we had a floating picnic right on – well, over – its deck. The Thompson is a wrecked hulk, covered in amazing textures and slowly being overtaken by algae, barnacles, and rust. However, the salty waters of the bay didn’t make it this way: It was purposefully sunk and used for bombing practice (with dummy warheads, luckily). 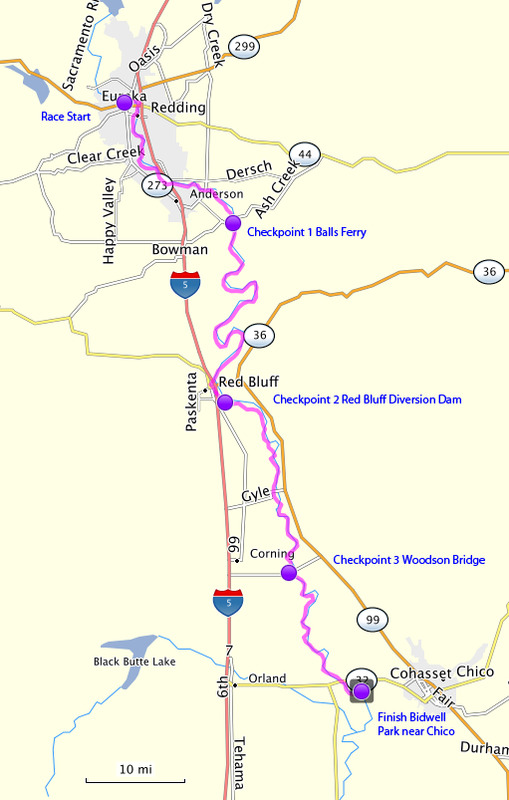 Local paddlers can put in at Redwood City near Corkscrew Slough and head pretty much due west. You can’t quite see it from the sloughs, but keep your eyes peeled and what remains of its superstructure is hard to miss. Support My Paddle for Charity! I’m gonna paddle my heart out in a 9.5-mile kayak race, the Sea Trek Regatta and ETC Paddle-A-Thon, on October 20 in the San Francisco Bay. All funds I raise will support Environmental Traveling Companions (ETC), who provides accessible outdoor adventure programs for people with disabilities and economically disadvantaged youth. Please donate to help out! Details below/after the jump.